Dressing up for Halloween is always my favorite part, but it is also the most time consuming part. You have to think of a costume which has to be good, you have to look for the parts, buy them, and then put the costume together. 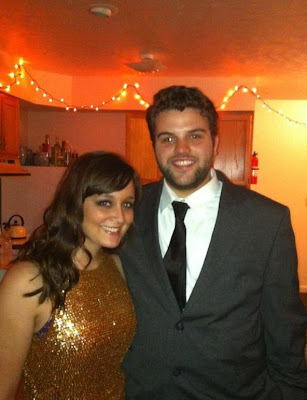 Last year, I found this ahhh-mazing gold sequin dress at Goodwill for $10, and I cut it short. I went as Dave's "trophy wife," but mostly we just looked really good. This year, I didn't want to buy anything. Maybe I might buy the lone accessory, but nothing substantial. 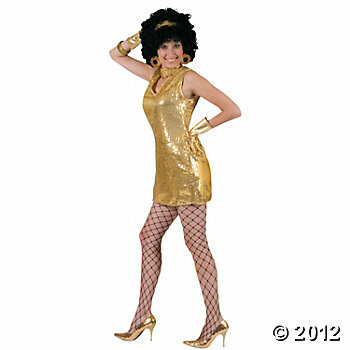 So I started coming up with ideas to use that wonderful little gold sequin dress. Here is what I came up with. Disco dancer. Some tights, a fun wig, and big earrings and I'd be groovy baby. Flapper. A string of pearls, a boa and a headband with a feather and I could jump right in to the roaring 20s. Upon much consideration to my three choices, I decided to go as Cleo. She just screams sophistication, especially in the gold. 2nd place was the flapper though. Maybe I can do that next year! Disco dancer probably won't ever see the light of day. I love the idea of keeping one piece that you love, and then updating it with accessories. Have you ever found one of these kinds of pieces in a thrift store? Is it as ridiculous as a gold sequin dress?